Comments - Terrific three panel kabuki paper model set of two tattooed heroes from the Suikoden battling with long wooden clubs in a snowy landscape. At right Kyumonryu Shishin, whose nickname is "Nine Tattooed Dragons," grips his weapon upright with both hands, his hair flying wildly around his face. 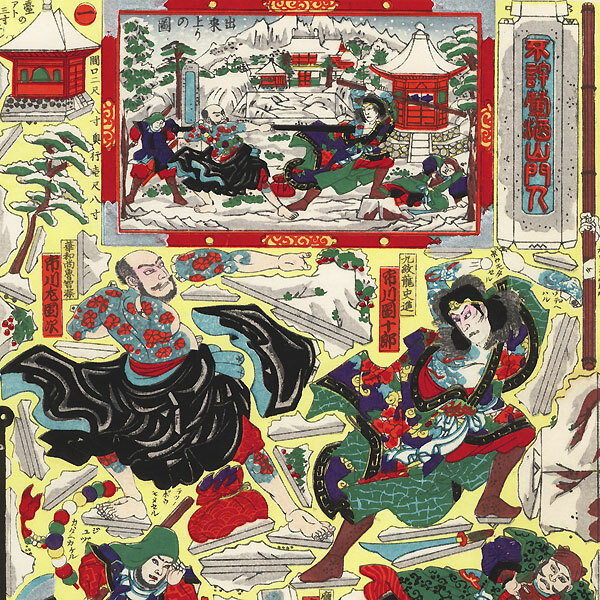 At left, the "Flower Priest" Rochishin thrusts his club forward at his enemy. 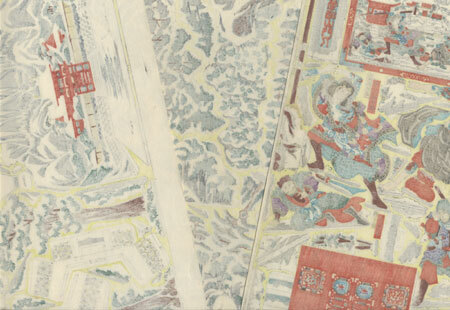 The extensive winter setting includes a snowy temple courtyard with tower, surrounded by snow-covered pine trees. Great color in this lively scene. A fantastic choice for a paper model collector or anyone interested in classic warrior subjects. Condition - Three separate panels. Bright and clean. One small hole in top corner from previous string binding, as is usual for paper model prints. Paperclip rust marks in top margins, a few light creases at edges. Please see photos for details.